The telegram, dated December 20, 1941, was sent to Doyle’s father, John. Weeks later it was confirmed that Bernard “Barney” Doyle, a 19-year-old from Red Cloud, Nebraska, had been killed in action while serving on the battleship USS Oklahoma during the Japanese attack on Pearl Harbor on December 7, 1941. Doyle was buried with full military honors at the Lake City Cemetery around noon on October 13, 2018, following a Mass of the Christian burial at St. Mary’s Catholic Church in Lake City at 11 a.m. High-ranking members of the U.S. Navy attended the services, which were open to the public. While Doyle’s remains had been classified as non-recoverable, a new chapter in his story is being written, thanks to advances in DNA technology that allowed his remains to be identified and returned to his family. Gov. Kim Reynolds ordered that all flags in Iowa fly at half-staff from sunrise to sunset on October 13 to honor Doyle. After graduating from Red Cloud High School in 1940, Bernard Doyle enlisted in the U.S. Navy on May 28, 1940, in Omaha. He was later assigned to the USS Oklahoma, which was part of the U.S. Pacific Fleet. The USS Oklahoma arrived in Pearl Harbor on December 6, 1940, one year and one day before to the fateful attack. The USS Oklahoma was on Battleship Row on the morning of December 7, 1941, when Japanese forces attacked Pearl Harbor. The Japanese used dive–bombers, fighter–bombers and torpedo planes to sink nine ships, including five battleships. The crew of the USS Oklahoma did everything they could to fight back, according to the official website of the USS Oklahoma. In the first 10 minutes of the battle, though, eight torpedoes hit the USS Oklahoma, and she began to capsize. A ninth torpedo hit her as she sunk in the mud. More than 2,400 Americans died during the Pearl Harbor attacks, including 429 men on the USS Oklahoma. In the aftermath of the tragedy, however, families back home didn’t know if their loved ones had survived or perished. Fran Nutter displays her older brother Bernard’s picture and his Purple Heart. In the weeks following the Pearl Harbor attack, the remains of men lost aboard the USS Oklahoma were recovered, and 35 were identified. Doyle was not among them, though. 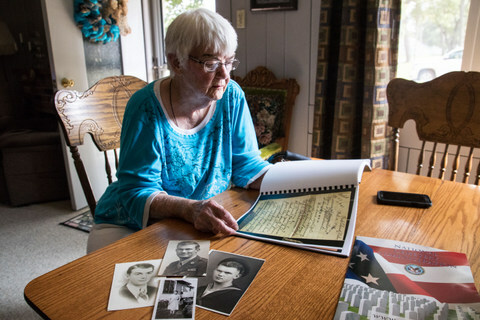 “For two months, my parents had no word about my brother’s fate,” said Nutter, who has a note her parents wrote to the Navy on February 10, 1942. “You can almost sense the desperation in my mother’s letter,” Nutter said. All four of Nutter’s brothers, including Johnnie, Bernard, Eugene and Robert, served in various branches of the military during World War 2, including the Army, Navy and Marines. Of the four, only Bernard Doyle never returned. “I know for a fact that Bernard’s death inspired my brother Eugene to enlist,” said Nutter, who added that Eugene Doyle was a 17-year-old high school student at the time and needed his parents’ consent. 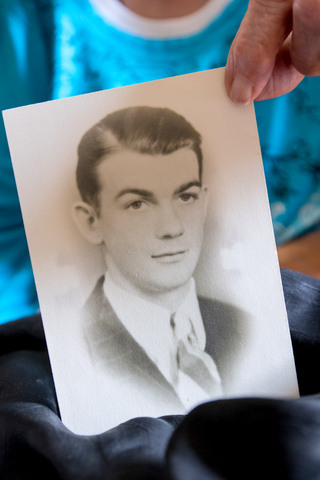 Memories of Bernard Doyle, who was awarded the Purple Heart, never faded among his family. When Nutter and her late husband, Dean, traveled to Hawaii for their 45th wedding anniversary in the late 1980s, they visited the Punchbowl and saw Bernard Doyle’s name on a memorial. “I didn’t know his name was there, and I started to cry,” Nutter said. By 2003, the U.S. military started trying to identify individual remains of U.S. service members killed at Pearl Harbor. The process was difficult, however, since DNA technology was not as advanced as it is today. Also, remains of deceased service members were sometimes mixed together. In some cases, the partial remains of more than 100 service members were placed together in one casket. 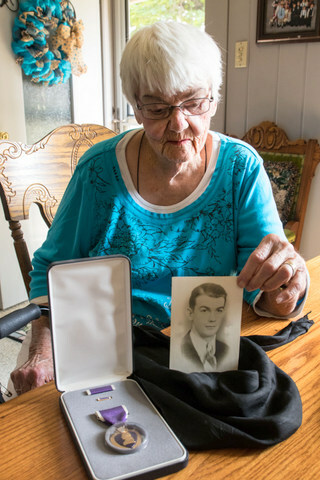 As DNA technology advanced, the military renewed efforts to identify those killed at Pearl Harbor. In 2015, all remaining caskets at the Punchbowl that were associated with the USS Oklahoma were exhumed. The remains were transferred to laboratories in Hawaii and Offutt Air Force Base in Nebraska. In 2015, a representative from the military called Nutter to update her and send her a DNA kit. Nutter and various family members, including her daughter Deanne Grantham of Lake City, didn’t hesitate to provide DNA samples. “I thought, ‘Good, we’re on the right track,’” Nutter said. 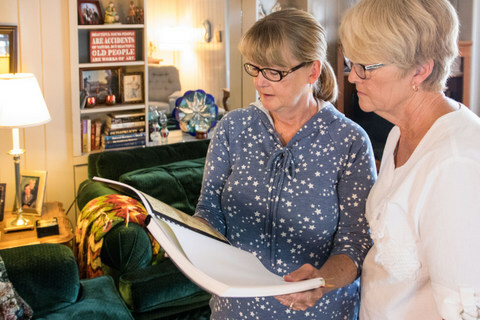 Deanne Grantham (left) and her sister Pat Albright of Lake City, Iowa, review information supplied about their uncle from the U.S. Navy. Doyle was positively identified by dental remains and an incomplete skeleton in very good condition, said Chief DeShannon Beaty with the U.S. Navy, who visited Nutter and her family in Lake City in August 2018 to share the findings. “It’s interesting and humbling to be part of this,” said Beaty, who noted that some families like the Nutters embrace this history, while others show little interest in the identification of their ancestor’s remains. Nutter wonders if Doyle might have become a teacher had he lived. “He was so patient,” she said. Darcy’s note: It was an honor to share this story of the Nutter family and Bernard Doyle, since the family members are close friends of mine. This article originally ran in the Fort Dodge Messenger. Thank you to all our servicemen and women who protect America. 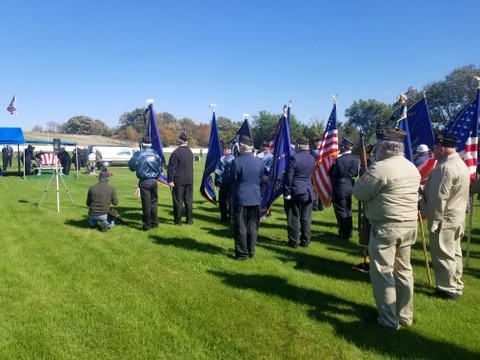 The funeral for sailor Bernard Doyle, killed at Pearl Harbor, was held Oct. 13, 2018, in Lake City, Iowa, with full military honors.